Anthony Cunningham questioned the decision to overturn a potential match-winning free for Roscommon against Tyrone but said his players would learn from the experience. When Roscommmon sub Gary Patterson was fouled in front of goal, deep in injury-time, it looked as if Cunningham's men would take all the points in the Allianz League Division 1 encounter. But after the whistle was blown, Ultan Harney ran in to shove Tyrone goalkeeper Niall Morgan, who hit the deck in dramatic fashion. After consultation with his umpires, the ball was instead thrown up by referee Noel Mooney and the Red Hand escaped with a draw. "In a lot of incidents, when it’s the last play of the game you don’t see it turned over," Rossies boss Cunningham told RTÉ Sport. "But the referee is there to judge those at that point. It’s something we’ll learn from. "We’re probably disappointed it happened. Most referees might not do that but for us it’s what happened and we’ll just move on for the next day." 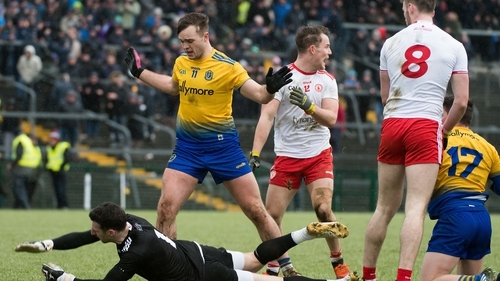 Speaking on League Sunday however, analyst Joe Brolly had little sympathy for Harney, who had scored 1-01 before committing the error, and suggested discipline could be an issue for Roscommon. Donie Smith was banned for one game following accusations of eye-gouging on Mayo's Keith Higgins in the opening round of fixtures. "It was idiotic behavior to say the least," said Brolly of Harney's intervention. "That was a cast-iron guarantee of a victory. A 21-yard free straight in front of the goals. The last kick of the game. "There’s a wee thing in that Roscommon thing of just going over the line. "It’s a wee worry for them. I thought at times they were excellent but they’ll be disappointed because every point for them is vital for them in this league." Despite the late drama, Cunningham was happy with his team's display overall. "We were in a very good position at half-time," he said. "We got some tremendous scores and were probably on top in a lot of areas on the pitch. "Ten minutes into the second half we had coughed up a few easy scores. We probably coughed up some soft possessions and that’s something we’ll look at it for the future. "So it was disappointing at the finish. But a huge performance by the guys again and one we’re really happy with." The Galway native also revealed that forward Diarmuid Murtagh had resumed light training but was still "a month or two away from full contact" as he recovers from a detached retina while Brian Stack and Sean Mullooly were back training fully after injuries. Roscommon are away to still pointless Cavan in round four on Sunday week.